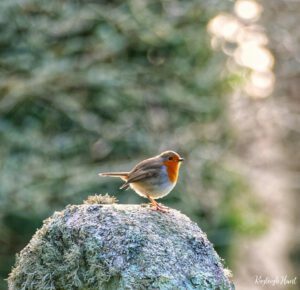 Caring For God's Acre > About Us > News & Blog > Birds > A little bird told me – New evidence supports the work of those caring for churchyards! Guest blog post by Kayleigh Hunt – BSc Zoology graduate and churchyard management advocate. As our world becomes ever more urbanised and agricultural practices more intensive, it is important that our pockets of green space are protected and preserved. 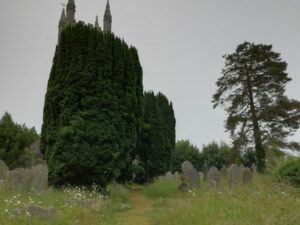 Churchyards can often be the only remaining unimproved green area within fragmented landscapes and therefore have an important role in conserving natural habitats. Preserving an area such as a churchyard may not only benefit the fauna and flora, but people too, with it now being understood that nature can have positive effects on our well-being. The very act of working together to enhance these spaces can also have a wider benefit to the whole community, in terms of bringing people together socially, providing an opportunity for outdoor exercise as well as giving them something to be proud of, now and in the future. My interest in biodiversity within churchyards began in my second year of university whilst studying at Cornwall College Newquay. For my second year project, I decided I wanted to look at how avian communities vary between urban and rural green spaces. My supervisor suggested I study avian communities within urban and rural churchyards, the rest they say, is history! I became so passionate about churchyards serving as natural havens that I decided I wanted to look at the subject in greater detail for my dissertation in the final year of my Zoology degree. My dissertation focused on how the habitat composition of rural churchyards in North Cornwall affects avian communities. I’m sure by now you can tell I’m not only slightly obsessed with churchyards but also with birds. I am a self-confessed twitcher and all round bird lover! Birds are also ideal subjects for studies such as these as they are excellent environmental indicators and the range of bird species within a churchyard not only reveals information about the avian community but other communities as well. For example, where there are insectivores, it is likely the invertebrate community is thriving. Data collection for my dissertation involved two visits a day for two days to each of the ten chosen churchyards in North Cornwall. Six points were established throughout each churchyard and the maximum number of individuals of each bird species seen at any one time was recorded. As well as this, habitat variables were recorded, including tree cover and grassland structure. Results revealed that the most influential habitat variable on bird diversity is grassland structure. The management of grassland varied greatly between the ten churchyards and could be divided into three categories; overly managed (mown), well managed (overgrown and mown areas) and unmanaged (overgrown). The three ‘well managed’ churchyards had the highest levels of bird diversity, with the overgrown sites having higher diversity than the mown sites, which had the lowest diversity. At one site, between two visits, the overgrown grass was cut. Wildflowers and any invertebrate life inhabiting the area were lost. Despite this, it provided extremely interesting and important findings, with just 15 bird species observed following the cut, compared to 26 and 23 before, in only one day. Very telling! 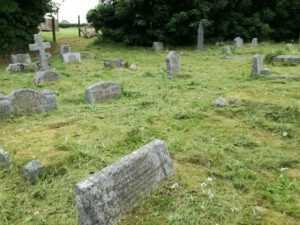 I discovered Caring for Gods Acre (CFGA) during the course of my research and therefore, knew that management of grassland is a big part of the advice they provide for those wanting to better manage churchyards. I also met with Robert Moor from The Cornwall Living Churchyards Project, a joint initiative between The Cornwall Wildlife Trust and the Diocese of Truro. 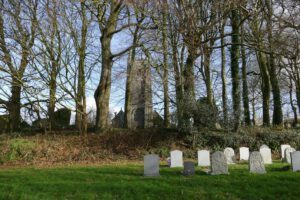 One of their main objectives is to diversify the grassland structure of Cornish churchyards to increase the range of wildflowers and invertebrates they support. I soon realised how important the findings from my project could be and that the science behind it could support the efforts of CFGA and local groups around the UK trying to help the fauna and flora in their churchyard. There is often an assumption that managing for wildlife means an untidy appearance and restricted access for visitors, but the reverse can be true. For example, access to graves will be required in most churchyards, and some authorities can struggle to maintain this given limited budget, leading to complaints. However, a good conservation management plan can provide for both the needs of wildlife and the needs of people, by leaving some areas longer and uncut, freeing up resources for the maintenance of short grass, which then adds to the mosaic of habitats as well as improving access. This is only one example of how, if our churchyards are better managed, both the public and biodiversity can benefit. With the formation and recent funding of The Beautiful Burial Ground Project, the hard work of those at CFGA and of churchyard task teams around the UK, together with scientific research such as my own, the future of biodiversity in our churchyards is looking bright! If you’re reading this and want to better manage your churchyard, why not look into setting up a local group? There are so many ways you can help the wildlife in your churchyard from introducing a small wild corner to managing the whole area for biodiversity. It really is so important that these ancient green spaces are preserved to help our increasingly struggling wildlife and any little really does help!